Pro tips for exploring some of our favorite places around the world — hotels, restaurants, shopping, and more! We always fly into Bangkok and give ourselves two full days to explore the city. Check out the palaces and take a boat ride down the Chao Phraya River to see most the highlights more conveniently. Try to get reservations at Gaggan if you are feeling fancy while you are there. It is INSANELY amazing. 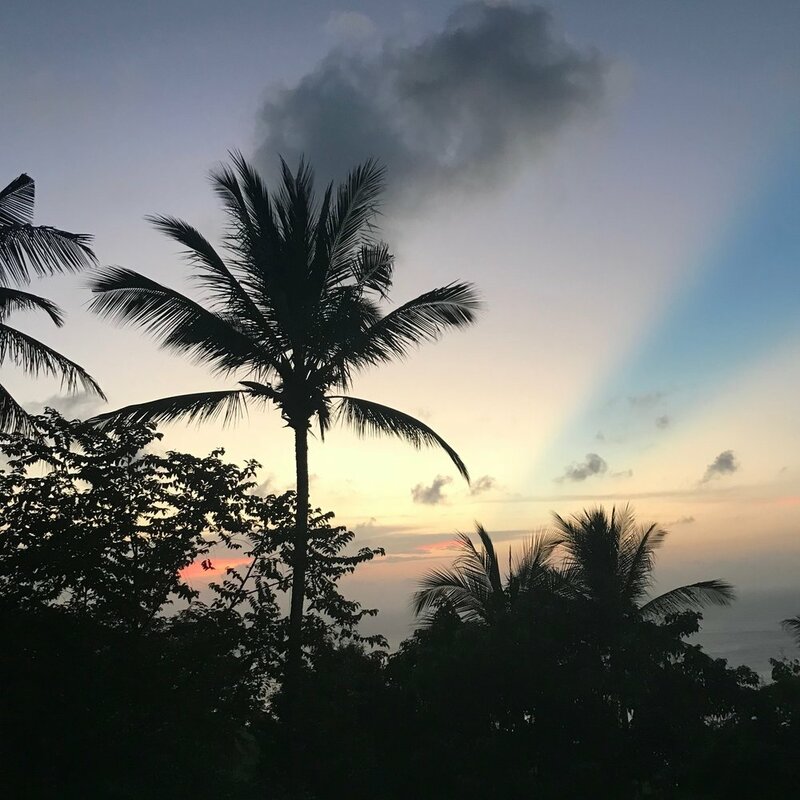 Book a roundtrip ticket from Bangkok to Ko Samui on Bangkok Airways (this is one of our favorite little airlines of all time...super affordable and always on time. It is very convenient to book a combo ticket that will include your transfer from the airport to the pier and your ferry ticket to Koh Tao. You will leave from Bangkok, take an hour flight to Koh Samui, get picked up at the airport and take a 30 minute ride to the pier where you will get on board the boat to the islands. (The ticket just includes the catamaran and dock transfer. We would recommend the high speed Lomprayah ferry). They make one stop on the way there (Koh Phanagan) and then the next stop is Koh Tao. TRUST US. It is worth the extra stop! Wave goodbye to everyone as they get off one island short of paradise. BOOK A VILLA that can pick you up from the port and take you to where you are staying. Iyara and some of the smaller shops near the pier! Sunscreen and BUG SPRAY. Yep, you will want the “real deal” in both scenarios. Have dramamine ready for your boat ride out there! Nine times out of 10 it’s perfectly smooth but yes, it is possible you might be met with rough waters. When you land in Bangkok, grab a SIM card for your phone. It will cost about $20 for unlimited data. You will WANT this to navigate around Bangkok and more importantly Koh Tao! 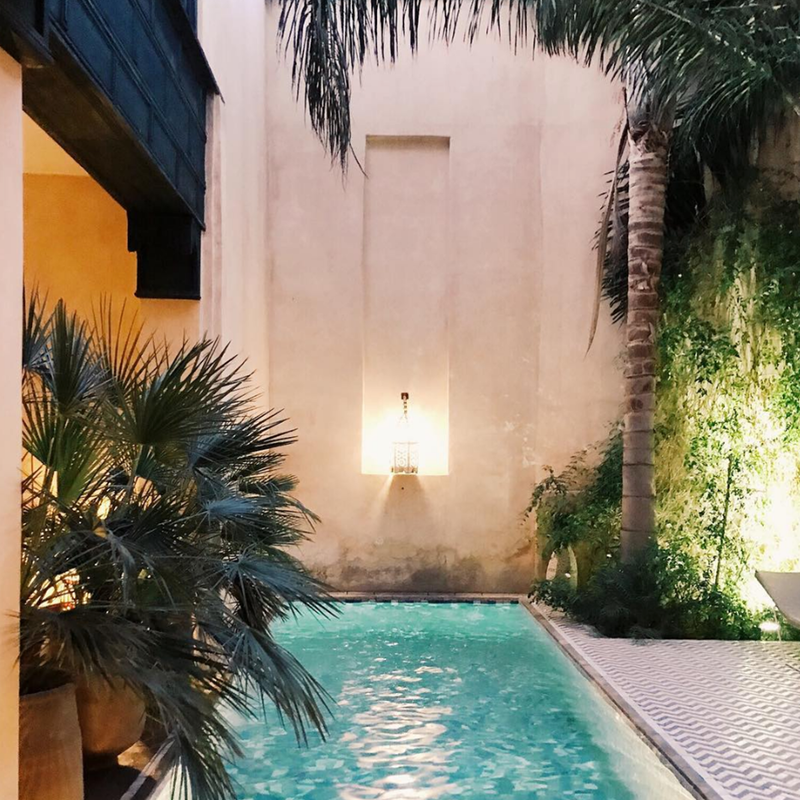 We know how overwhelming traveling to a brand new city can be, especially when it’s a unique place like Marrakech! Before we travel, we obsess over all the possibilities and recommendations we come across. The recommendations we received from friends at home and locals on the ground were key to making it such a great trip! Hopefully we inspired you to check Morocco out for yourself. If you plan to go, here are some suggestions to make your trip great. We absolutely fell in love and already plan to go back. Also! We brought so many great things back with us! Check out our Studio Party to get first dibs on rugs, poufs, blankets, decor, and more! Whatever is left will be for sale in our shop! We’ve traveled a lot and El Fenn is the most inspirational hotel we have ever been to. Every room is different and unique. The owners have a strong sense for design and the whole experience is inspiring. 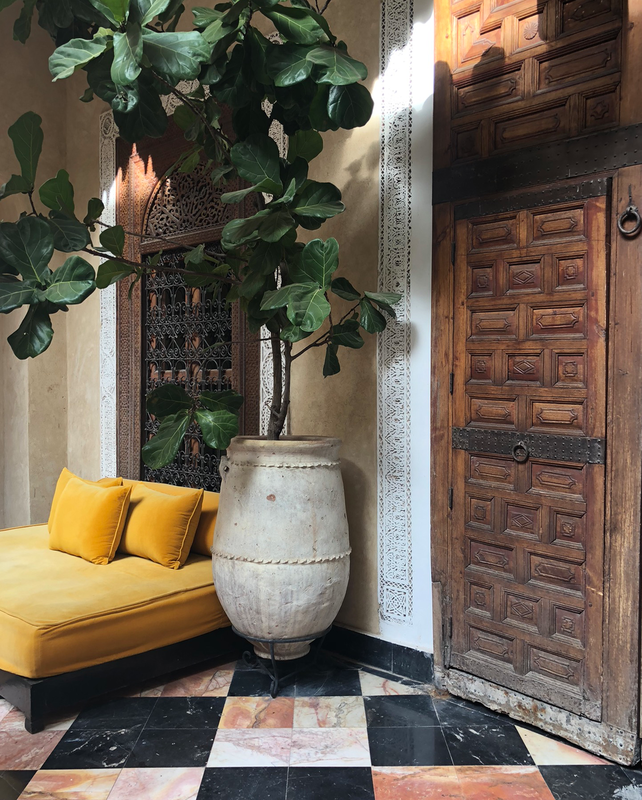 It’s not just the rooms or the rooftop bar with views of Marrakech and whole medina, but it's the color it's the tile, it's the attention to detail. 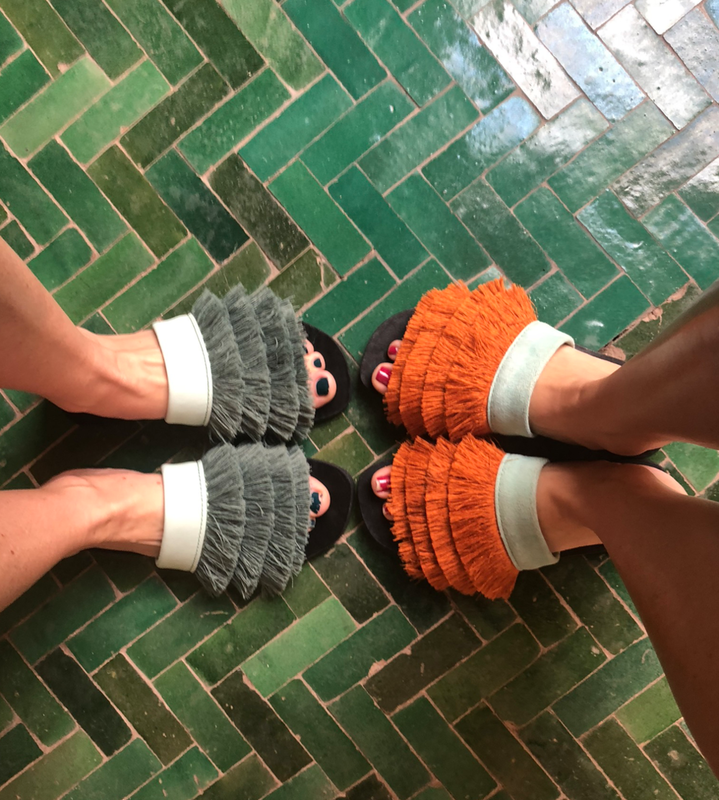 Mustapha Blaoui // Chabi Chic // and of course the many souks offering Moroccan poufs, bags, galore! *Be ready to bargain! Naranj Restaurant for the best Lebanese food we have ever had. Corner Cafe for amazing sandwiches, salads and fried goodies. Be sure to get there from 5 to 7 p.m. when they offer their “Snack Time”! Don’t be fooled by the cute name, this “snack time” is a sophisticated menu with everything from charcuterie boards and smoked salmon bruschetta to homemade Moroccan sweets. 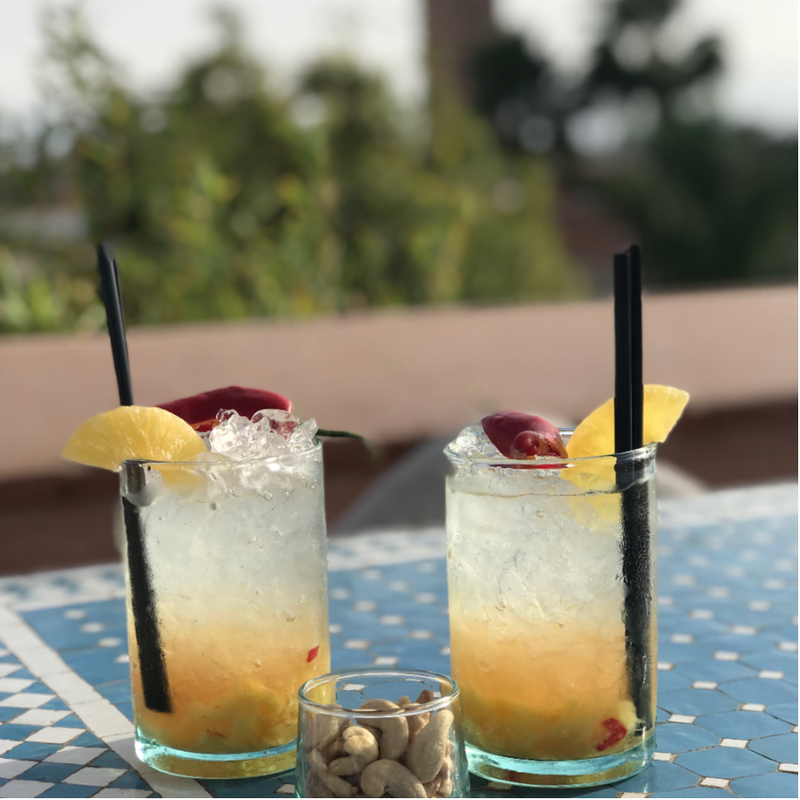 Be sure to enjoy it with one of the best cocktails we have ever had — the “Spicy Caipirinha.” Or try it at home — they were generous enough to share their recipe! Enjoy a traditional hammam experience at your riad! // Go with an open mind and leave with glowing skin.